With a properly installed valve on your meter, your home and family is protected from earthquake related gas fires 24-7 whether you are home or not. 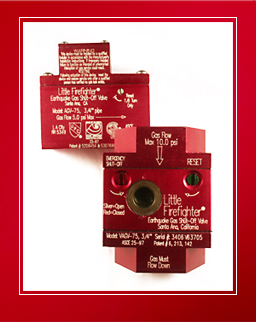 We exclusively use The Little Firefighter gas valves to bring you peace of mind. When safety counts, depend on a seismic gas valve professionally installed by The Earthquake Valve Specialists. When your meter experiences a magnitude 5.4 seismic event the flow of gas is instantly inhibited by an object blocking gas from fueling any flames in your home.